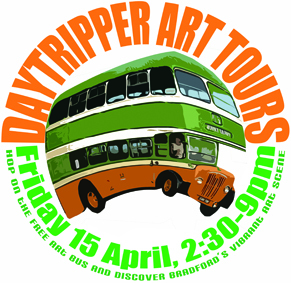 Hop on the free Art Bus and discover another side to Bradford! Look out for the striking retro orange and green Art Bus as it tours around Bradford’s galleries, museums, and creative places. It’s an easy fun and free way to travel around the city and see lots of fantastic exhibitions – and don’t worry if you haven’t been to a gallery before, friendly staff will meet and greet you. The vintage Art Bus, courtesy of Keighley Bus Museum has a simple route, five bus stops and a welcoming conductor to keep you entertained and informed along the way. You can do as little or as much as you like. Whether you’re hopping on for one stop or staying for the whole tour, enjoy a leisurely trip around Bradford looking at eye catching, interesting exhibitions, and enjoying free tours and creative activities. The final tour, departs from the National Media Museum at 5.30pm and goes to South Square in Thornton and then off to the Bronte Parsonage in Haworth for the opening night of their new show. You could then pop into one of the lovely local pubs before making your way back to Bradford. (Timetables for local buses and trains below). The Lives of Great Photographers is a compelling new exhibition drawn exclusively from the Museum’s extensive and diverse Photography Collection, including works from The Royal Photographic Society Collection and the Daily Herald Archive. Together this exhibition presents a selection of photographs by some of the greatest photographers of the nineteenth and twentieth centuries. David Spero presents a selection of photographs from his series Churches. Taken in London between 2001 and 2006 the photographs document buildings that feature none of the usual monumental architecture of the traditional church with its overt symbolism of status and power. Temporary, semi-permanent and often un-consecrated, the churches are where we would least expect to find them, located in industrial estates, shopping parades, houses, cinemas, above pubs and commercial properties they reveal a contingent architecture of buildings that were never designed to be places of worship. Robert Hope makes work that mixes structure and styles and handwriting to create scenes of half-remembered and half-imagined places and events. The results are an engaging series of magical, humorous, sad and quirky worlds, partially identifiable and partially mediated through a childlike fiction and borrowing from youth culture and autobiographical and art historicy connections. The Illumination Exhibition tells the story of the King James Bible in its historical context and explains the importance of the text today. You can view a 1616 copy, recently discovered in the Cathedral plus a 1605 copy of the Geneva Bible, as well as take in the magnificent medieval architecture of the Cathedral, including very early examples of William Morris Stained Glass. The adjoining St Peters House is the home of acclaimed South East Asian Arts Group, Kala Sangam, who will offer a dance Iinterpretation of everyone’s favourite King James Bible Psalm – Psalm 23 “The Lords my Shepherd”, as well as the chance to sample drinks & light refreshments in Daisies Café, which opens to the public this afternoon to coincide with the Daytrippers events. This exhibition is a celebration of childhood from the Victorian era (1837 – 1901) and features paintings, toys and clothing from the permanent collections held by Bradford Museums and Galleries. The Bradford Open is an unrivalled showcase for the district’s artistic talent. Artists and craftspersons (16 or over) who live or work in the Bradford district have submitted up to three works to a selection panel, who will award prizes to the very best. Award-winning photographer Zed Nelson reflects on the cultural and commercial forces that drive a global obsession with youth and beauty. Thornton, the birthplace of the Brontë siblings, provides a fertile setting to revisit a past installation (For Emily, 1992) and unveil new drawings by internationally renowned artist Conrad Atkinson. Bus 663 departs from outside Haworth Old Hall Hotel. Bus 665 departs from the shelter across the road from Haworth Old Hall, at Haworth Park Top. Evening Buses from Haworth often arrive at Keighley Bus Station up to 5 mins earlier than the time advertised; in which case, it may be possible to catch a slightly earlier bus to Bradford. Allow 7-8mins to walk from Keighley Bus Station to Keighley Railway Station.